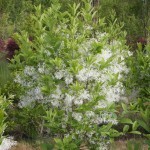 A slow growing large shrub or small tree with a spreading, open habit. 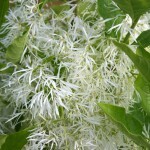 The white, mid-spring flowers are lightly fragrant and are borne on 8" long fine-textured, drooping panicles. 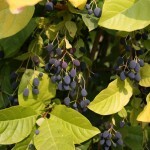 Dark blue clusters of small fruit are produced from female blossoms. The fall color is yellow. It is native to the eastern U.S. It needs full sun to part shade in an average well-drained soil. It is intolerant of prolonged dry conditions.